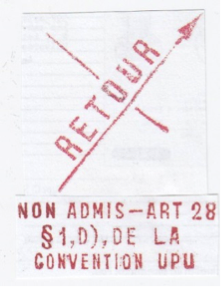 The UPU cannot declare invalid a stamp issued by a Member’s postal administration. In other cases, postal administrations relied on (non-binding) Recommendation C. 14 adopted at Ottawa 1957 and its successor Recommendation C. 93 adopted at Hamburg 1984 when they refused mail with unwelcome postage stamps of another Member. Recommendation C. 14 ‘calls on Members, when issuing postage stamps, to choose themes which contribute to better understanding between nations and cultures and to the improvement of international friendship’. 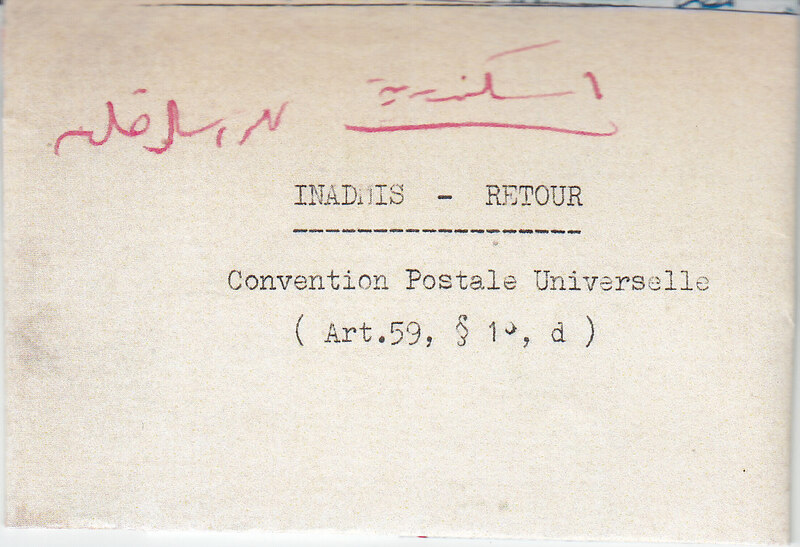 Only Hungary relied on Article 1 Section 2 of the 1952 Brussels Convention: ‘The UPU serves the development of….international cooperation’ and thus claimed that postage stamps with a political, anti-Communist theme impeded international cooperation. Brussels 1952: “Section 2, Chapter 1, Art. 1”. Where a Member feels aggrieved by the choice of a postage stamp’s theme made by another Member, it can send a protest to the UPU. The UPU is obliged to inform all Members about such protest by means of a so-called ‘Circulaire du Bureau International’. Circulaires are numbered. 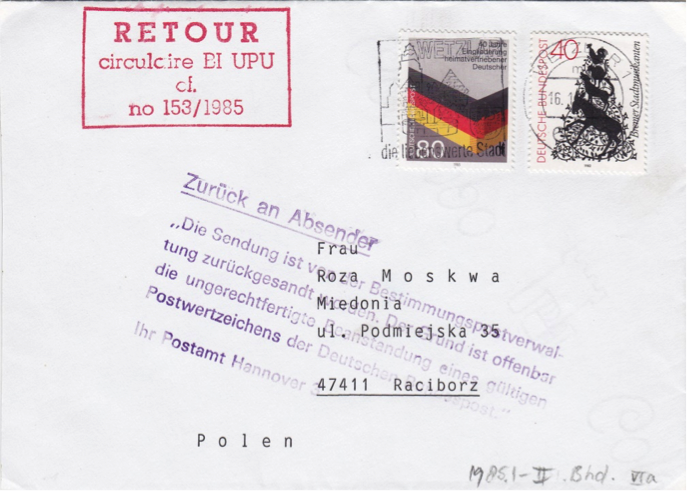 The Polish protest against the West German stamp with the theme ’40 years of integration of German refugees’ had the number 1985/153 (see copy at the end of this chapter). 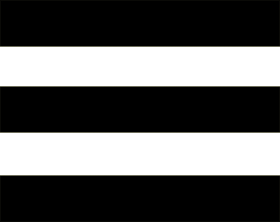 These numbers are sometimes referred to in cachets or in correspondence, with which the refusal of mail is justified. See catalogue number 1985.1. 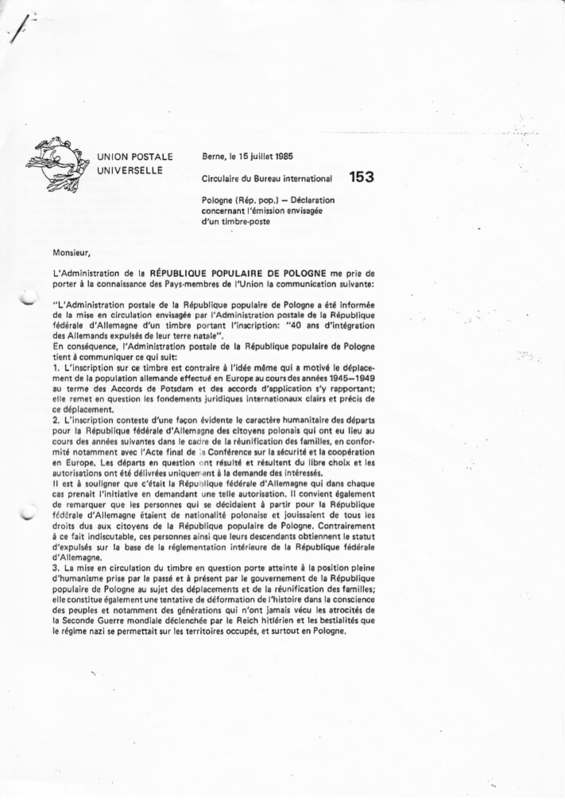 Copy of the UPU Circulaire 1985/153 in French: the Polish postal authorities protest against the 1985 postage stamp “40 years of integration of German refugees”. French is the official language of the UPU. That is why all texts on international mail are at least bilingual: in French and the language of the country itself.